I just recently joined Pinterest. The thing I like most about Pinterest is the rush of creative ideas, interesting recipes and DIY projects I have at my fingertips. 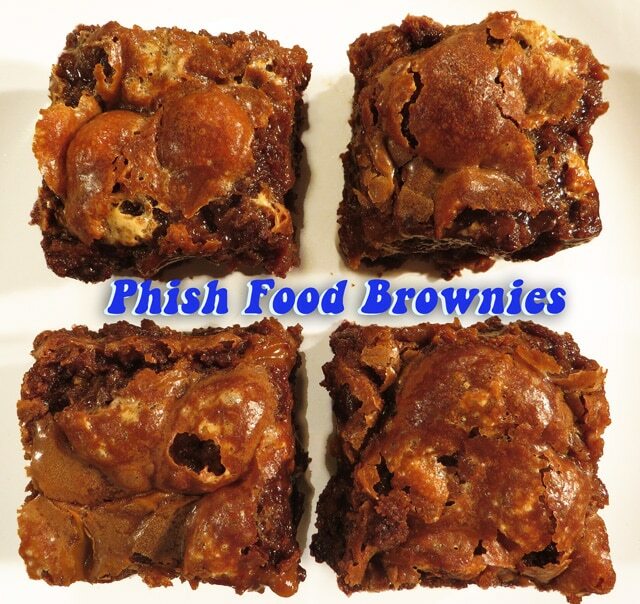 When I saw a ‘Phish Food’ brownie recipe, I immediately thought about my sister’s upcoming birthday. She isn’t much for sweets, and usually opts for carrot cake on her birthday, but she has always had a thing for Ben and Jerry’s Phish Food frozen yogurt. I can recall our early twenties when we lived together in Minnesota, every now and then a pint would spend a few days in our freezer as she’d savor a spoonful at a time. I thought home-made Phish Food-inspired brownies would be a perfect little something for her birthday. Now onto the challenges. Like most Americans, I never embraced the metric system, so I needed Google conversion and a digital scale to convert the measurements. I had also never heard of “Caster sugar”, but a quick internet search confirmed it’s just a very fine sugar found in the UK, and I could make my own using regular granulated sugar and my food processor. 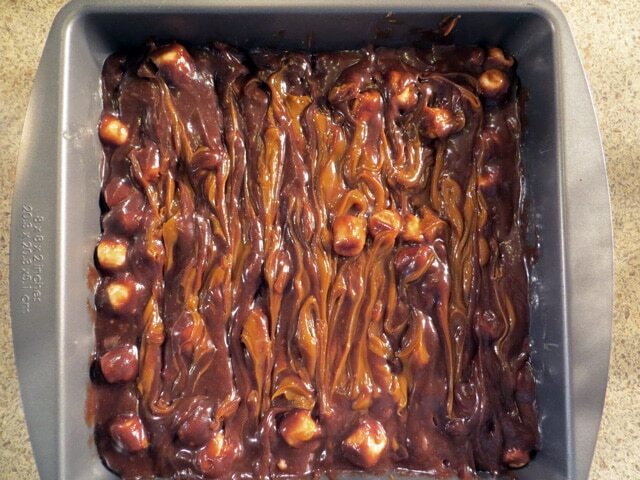 Since the original recipe gave the option, I opted to use Dulce de Leche rather than making my own caramel, although I am sure the brownies would be good either way. The rest of the prep and baking was pretty straight-forward, except the recipe only called for 25 minutes of bake time, but my brownies were completely unset at 25 minutes. They actually required a full 40 minutes in the oven and the middle still remained on the gooey side. These brownies are intensely rich, gooey and caramelly, which I loved. The only thing I would like to change is figuring out how to keep the marshmallows whole, rather than having them melt into the batter. The side effect of the melted marshmallows was definitely a richer and moister brownie, but I was hoping to retain the chewiness of the marshmallows to provide a texture contrast. 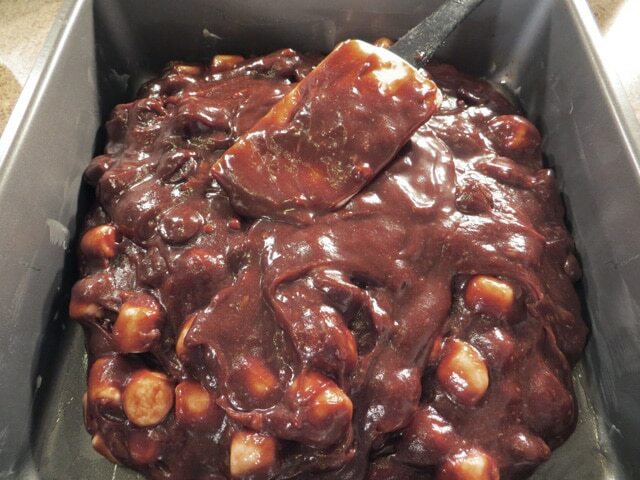 My friend Erika suggested that next time I should add some marshmallows to the very top of the brownies just a few minutes before the brownies are set, as a way incorporate the whole marshmallows. I think I’ll try that next time. However, despite not having the whole marshmallows, these brownies are still too good not to share, with U.S. measurements this time. Preheat oven to 325F. 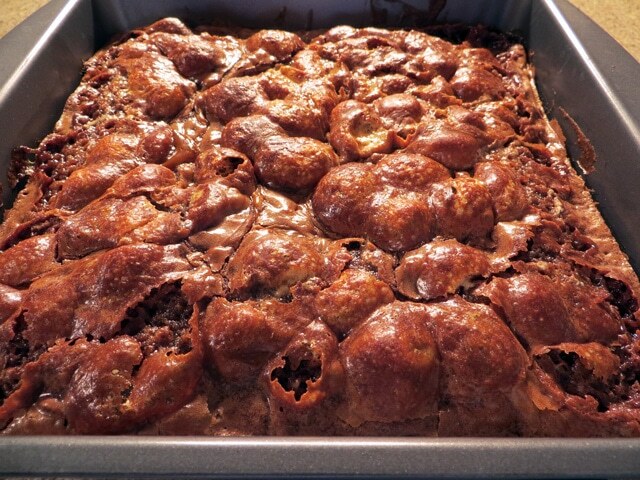 Grease an 8×8 baking pan. 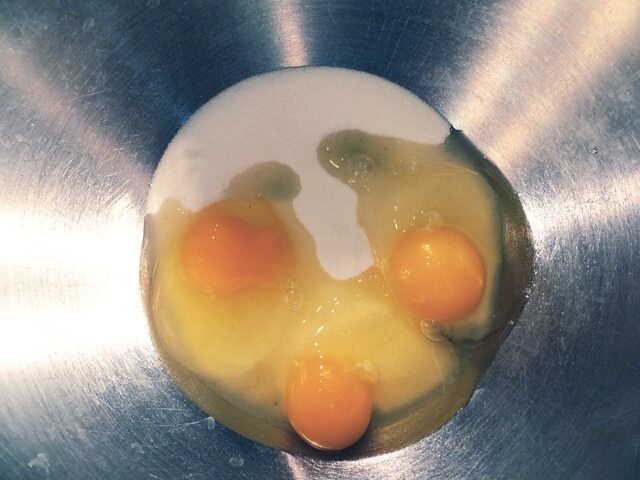 Beat the eggs and fine sugar* together until pale and creamy. 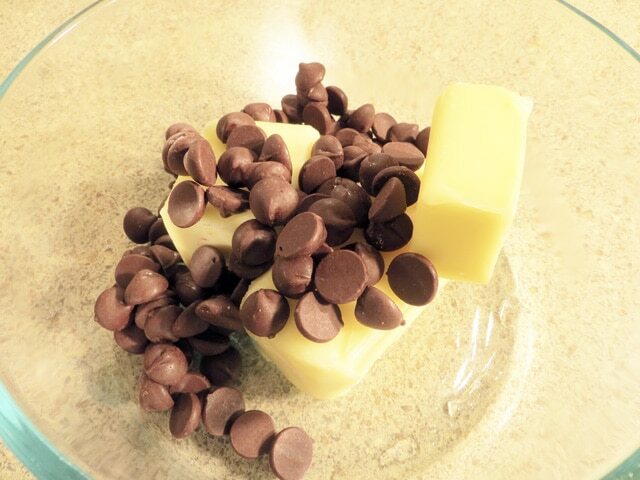 Melt the chocolate and butter until smooth (I used the microwave, just watch closely as to not over-heat). Set aside to cool slightly. 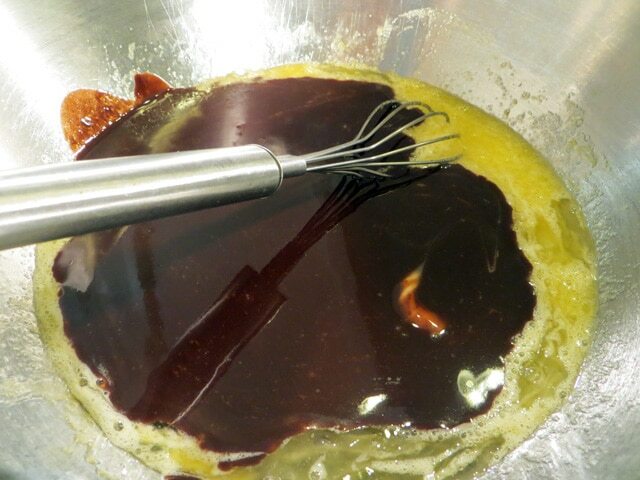 Once the chocolate is cooled, fold it into the eggs and sugar mixture with a spatula. 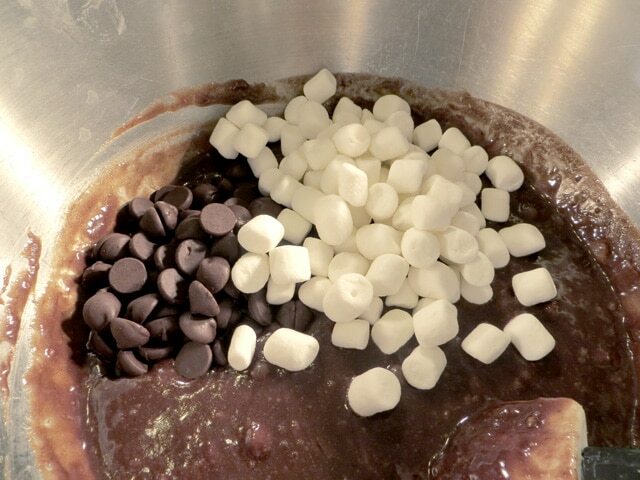 Next, gently mix in the flour and salt, once mixed, add in the chocolate chips and marshmallows. 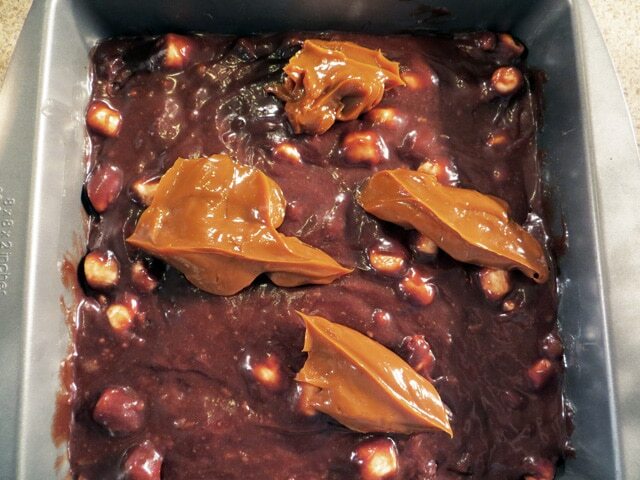 Pour the brownie batter into the prepared tin. 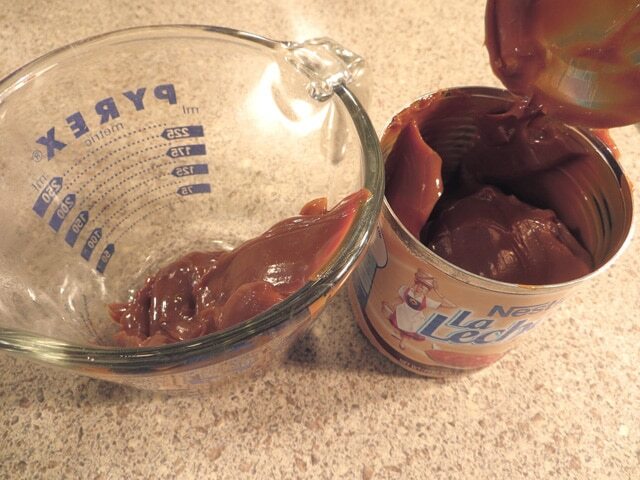 Spoon the dulce de leche in little dollops around the pan and then swirl gently into the mixture using a knife. Bake in the preheated oven for 40 minutes**, or until the edges are set and the center is still slightly gooey. Leave to cool completely before cutting into squares to serve. These brownies were pretty much one of the yummiest (and richest) treats I’ve ever eaten! I loved them! Best birthday present 🙂 And amazed they arrived unscathed!